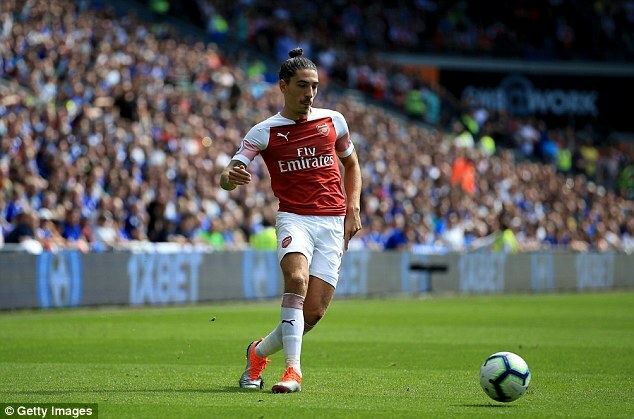 Arsenal defender Hector Bellerin has revealed that he has been affected by the abuse that he has received both online and during games. The right back is known for his unique fashion sense and disclosed that he has been subjected to insults relating to his hairstyle as well as his performances. Although Bellerin has ‘learnt to grow a thick skin’, he admits that it can sometimes be difficult to cope in such situations. Bellerin told The Times: ‘Some of it can get very abusive. Most of the abuse is online, but you hear it in the stadium, too. ‘The problem is that people have an idea of what a footballer should look like, how they should behave, what they should talk about. Bellerin also disclosed that he deleted Twitter on his phone for a while due to the barrage of negative messages that he was receiving. He said: ‘It can be a blessing and a curse. When I first came into the ranks at Arsenal, the expectations were very low so people were often impressed when I played well. ‘But then, when I played badly, the stick got crazy. The worst was a year and a half ago. A lot of people say nice things but it is natural to focus on the bad. The 23-year-old, who has been capped by Spain at senior level on three occasions, also claimed that it would be impossible for a Premier League footballer to come out as gay. He said: ‘It is impossible that anybody could be openly gay in football. ‘Some fans are not ready. When it happened in rugby with the Welsh player [Gareth Thomas], people respected the situation. The fans respected his decision. Regarding matters on the pitch, it has been a time of considerable change for Arsenal with Unai Emery being appointed as head coach following the departure of the long-serving Arsene Wenger. Many of Wenger’s coaching staff departed along with the Frenchman and Emery has got off to a mixed start, with Arsenal losing two and winning two of their first four Premier League fixtures. Bellerin said: ‘It feels like a new club. We have so many new staff. It’s a shame for those who have gone, and I am grateful to them all. Some had been at the club for many years. But you can understand why a new person would like to put their own stamp on the club. Bellerin has fended off competition from summer signing Stephan Lichtsteiner to start all four games so far, but, while he has provided a threat going forwards, he has been suspect defensively. However, Bellerin is confident that Arsenal will soon benefit from Emery’s detailed approach. He said: ‘I am impressed with Emery. We lost our first two games but we were very close both times. After the match, the players could feel that things were coming together. With Arsene, he wanted us to play in the same way regardless of the opponents. The idea was that we could play in our way and beat anyone. Arsenal return to action after the international break when they face Newcastle away on September 15.